In his seminal work The Poetics of Space, Gaston Bachelard discusses the poetic image, which he posits as something radically different from metaphor, a petrified image to which we have become habituated. A poetic image is something unprecedented, and thereby creating something unprecedented. Marja Kanervo modifies spaces in much the same way as a poet conjures up images and spaces with words. By removing structural components so that displaced elements form written words (MORE/LESS, 2013), or by adding artefacts that redefine their surroundings, she transforms the physical site which the viewer occupies into a dream-like ‘imaginary space’ that is charged with an emotional intensity that is difficult to express in words. The pieces featured in her retrospective at Kiasma in 2013 – a textual panorama, a deconstructed Wendy house, hair-reinforced concrete panels, concrete beds with human hair stuffing, and shirts adorned with buttons of human teeth neatly folded in display cases – acquire their meaning through their emphatic materiality. We viewers are forced to ask ourselves: what are my personal reactions to these seemingly familiar yet strangely warped and disjointed dream-like states? Tarja Roinila, 2003. ’Gaston Bachelard, tilan ja poetiikan filosofi’, in Bachelard, Gaston, La Poétique de l’espace, 1957. Helsinki: Nemo, 12–14. Featured image: Marja Kanervo, Pallet I–III, 2013, installation, Museum of Contemporary Art Kiasma. Photo: Finnish National Gallery / Pirje Mykkänen. In the vaulted White Cellar in the basement of the Sinebrychoff Art Museum, Helsinki, a dozen or so conservators – many from museums across Finland, and including Tannar Ruuben, the paintings conservation lecturer at the city’s Metropolia University of Applied Sciences – are gathered around a table, peering at the back of a 17th-century wood panel painting. The table is specially made for the highly sensitive work of restoring and conserving rare works of art painted on wood. The clamping table, as it is known, has been constructed by Jean-Albert Glatigny, Conservator at the Royal Institute for Cultural Heritage in Brussels, who is considered to be the world expert on restoring wood panel paintings. He is here to lead a 10-day practical workshop sharing his expertise in the structural stabilisation of these works with a new generation of conservators, passing on his knowledge in this highly skilled field. The clamping table he has brought with him from Brussels is used to glue splits in the panels and to repair joints with a high degree of precision. Tannar Ruuben was so impressed by it that he decided to buy it for his conservation department. 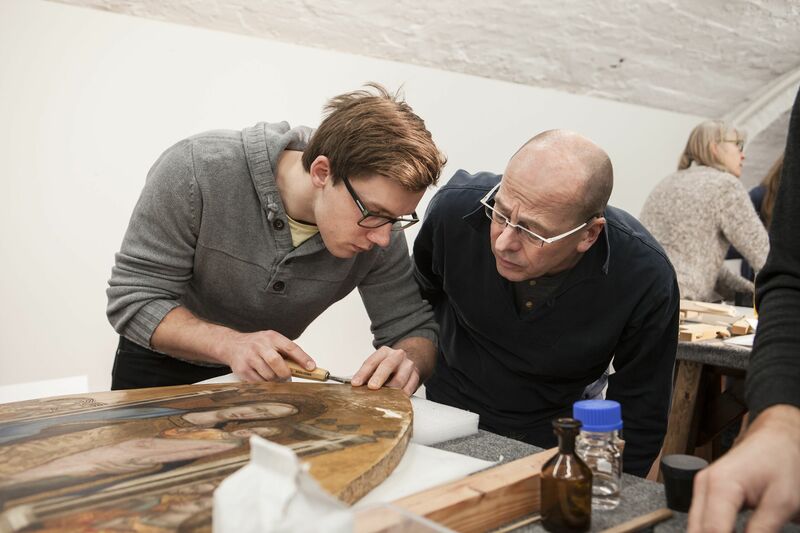 The workshop has come about as a result of the Getty Panel Painting Initiative, an ongoing project that aims to increase specialised training in the structural conservation of panel paintings and to advance the treatment of these works in collections around the world. The project was brought to the attention of Kirsi Eskelinen, the Sinebrychoff Art Museum’s Director, when in 2010 she met Prof. Jorgen Wadum, keeper of conservation and director of the Centre for Art Technological Studies and Conservation (CATS) at Denmark’s National Gallery, who was involved in the Getty initiative. At that time Eskelinen was head of collections at the Serlachius Museum in Mänttä and had been seeking guidance on the repair of the 16th-century panel attributed to the studio of the Flemish painter Quentin Matsys, Madonna with Cherries which, she says, ‘was actually in two pieces’. Wadum visited Mänttä to advise on how best to proceed with its restoration and, says Eskelinen, ‘he asked us if we need this kind of specialist knowledge throughout Finland’.